This week I found myself faced with a somewhat unusual situation of not having the right weight of fly to meet my tactical angling needs. 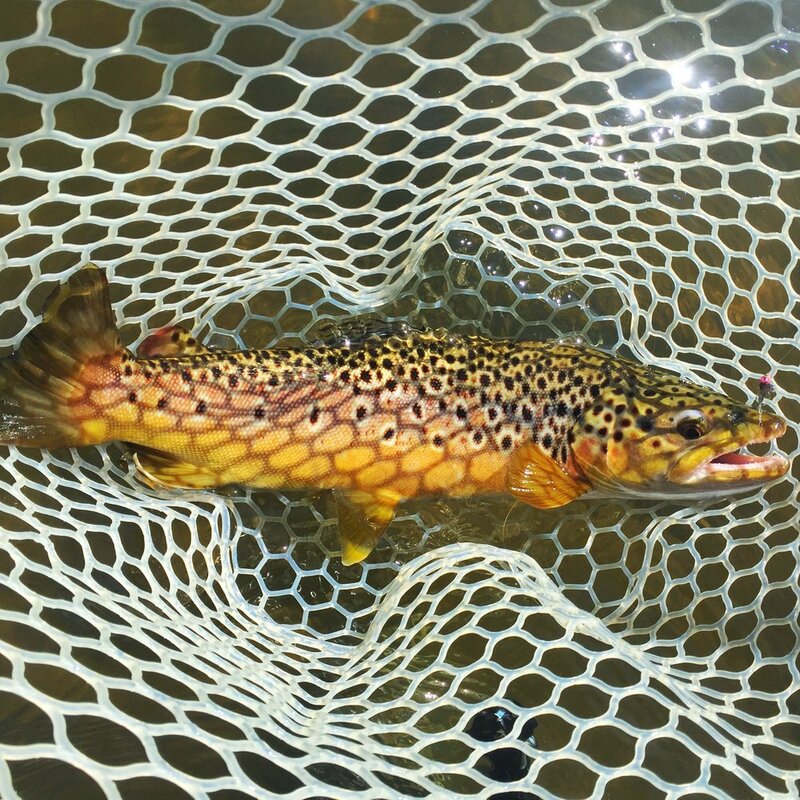 I have been dredging the depths of rivers for so long looking for the largest fish a stream might hide that I completely overlooked stocking my boxes with lightly weighted flies. My tactical focus became locked in on presenting heavily weighted nymphs in deep slots and thus ignored having a good plan for low water conditions. The Rivers in Western Colorado are currently flowing below average for this time of year. With our rivers so low, the pools that I frequently fish are now shallow, which causes a significant change to the hydraulics. This change in the hydrology moves fish out of the reliable pools and into other locations within the stream channel, generally, in pockets behind boulders or riffles. My attempt at drifting dense stonefly patterns into those locations was an exercise in futility. Fishing densely weighted patterns in shallow water may require more effort in maintaining a good drift, and in fact, it can be tricky. I am re-tooling many of my favorite spring fly patterns to be lighter to make low water tactical angling manageable. I am tying Perdigon nymphs with smaller than usual beads for gently sinking into shallow pockets behind boulders and soft hackled stoneflies for drifting just above the cobble in riffles. I even added a few smaller streamers that I can fish with my thirty-foot French leaders. While it is necessary to match the prevailing benthic macroinvertebrates that are present in your trout waters with our pattern selection, it is also vital to match the conditions as well. This year's low water will require an adjustment in tying lighter weight nymphs, so they will slowly reach the bottom without immediately banging into or getting snagged in the rocks. Brass beads are a lighter alternative to using tungsten beads can offer the solution for this requirement. Besides bead selection, color is also an essential factor to consider. Somber hued, less flashy patterns are less likely to turn off the fish in low water conditions. Leave the bright hot spotted attractor patterns at home until it rains. Choose materials such as pheasant tail fibers, hares ear fur and partridge. These materials are buggy and dull lending to a natural looking fly. If using reflective materials such as tinsel, do so in a judicious manner. A little glint in a fly pattern can make them more attractive to fish, but just a dash too much can ruin it. When I guide with guests who wish to learn more about fly fishing or to sharpen their skills, I teach them two mantras: fish the edges & the foam is home. Finding fish is the most important part in fishing. However, you would be amazed at how many times I show up to a crowded beat on a river and see people ignoring the prime water, and instead, fishing water because they are observing an occasional fish feeding here and there. They are fishing with their eyes and not their river reading skills. Knowing how to find hidden fish in heavy water can yield big results. 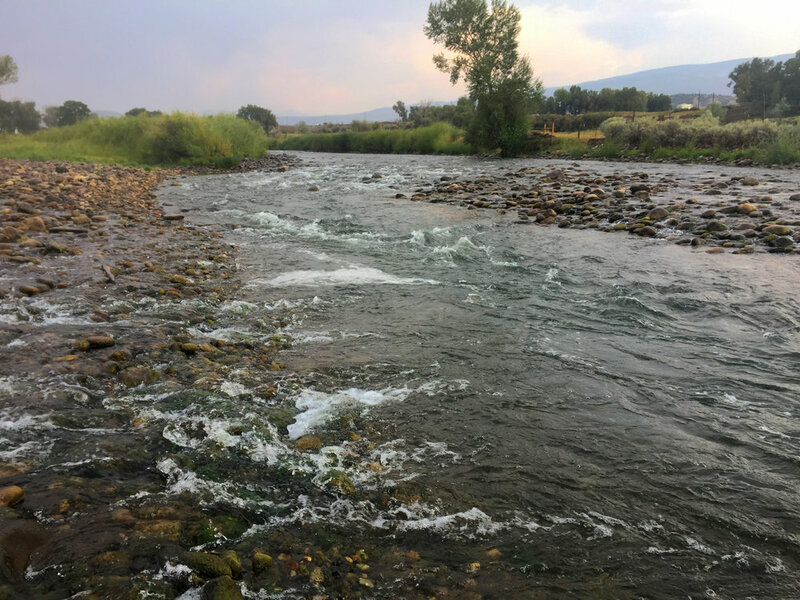 Recently, I was on a popular beat of the Yampa River in downtown Steamboat Springs. I have a favorite spot that conceals a lot of very nice fish. My river log will tell you my success on the Yampa and much of it can be correlated to this particular spot among just a handful. The froggy pool above me had two anglers swinging patterns to no avail and the pool below me was occupied, as it usually is on a daily basis. Yet, right smack in the middle of the river lays my favorite spot hidden in plain sight. I wade across to begin my approach while thinking to myself that surely, someone had to have pounded this spot and my efforts might be to no avail. I made my second cast and hooked and landed a nice 18" brown. I hooked and landed a few more fish and broke off a large gator rolling rainbow. I know that this spot does get fished as I have removed many flies that have broken off in the snouts of fish here. Perhaps these fish had been hooked elsewhere and sought refuge in this rarely fished spot? What makes that particular spot on the Yampa and other similar spots unique is that it contains well defined edges and foam lines. An edge is where differing current speeds slip past each other and are often bordered on one or both sides by heavy water. Steelheading anglers know this as a current seam and that is where steelhead like to hold or travel along. Edges can also be defined by channel morphology such as gravel bars and drop offs or converging currents. In short, it gives fish structure both above and below the water surface. Fish need three conditions for basic survival. Cover from above, a steady predictable food source drifting within close proximity and respite from the current. Edges usually provide all three of these conditions. If you find edges that contain a bubble line or a foam line you have found an ideal location to probe with a tactical nymph. Bubble lines are a clear indication of a current feature that funnels everything drifting downstream into a reliable path and if one is located near an edge you have eliminated a lot of guesswork. You can read about foam lines here. The image below is perhaps one of the best examples of what a very "edgy & foamy" section of river can look like. On the left is a gravel bar forming an edge with a heavy section of current forming the other edge. A foam raft near the top provides cover for fish and the bubble lines gives us a clue that there is a food path for the fish. This pool also provides cover from above and bowling ball sized boulders on the bottom providing a buffer from the current. You can see the size of the boulders middle upper right. I watched two anglers fish this pool before I reached it and I managed to catch a few more fish out of it before calling it a day. Green areas are the prime spots within the confines of this edges to pay special attention to. Don't forget to fish both sides of a heavy current edge and any pockets whereabouts additional fish might be found. This pool is another example of an edge. Here, converging currents create a hydraulic edge thus defining a feeding lane and cover from above. Fish will hold very near the fast water slipping away to intercept anything edible that might be coming down the pipeline. There is a special spot near the top center of this riffle where the fish are protected on both sides from current cover allowing them to move either left or right in search of food. Can you find the sweet spot? It's worth attempting to fish the near side of this current edge however, heavy angling pressure will likely cause the fish to concentrate in the water seeing less pressure. I landed a 21" rainbow and 18" brown rainbow out of the green section of this beat. This beautiful bow was pulled from the sweet spot within a hydraulic edge. Have fun out there looking for those edges both obvious and more subtle. In the images below, I illustrate some of the most obvious instances of water that contains bubble lines, current seams and structure. If you stumble upon a small section of water that contains all three, take a moment to analyze what you are looking at. Chances are there may be a feeding fish. In figure 1. You can see several prime structures you should look for when searching streams for likely trout holding water. There is an obvious current seam defining the slow and fast water, obvious underwater structure fish can use to hide near and a bubble line funneling food into the best possible holding spot. Can you identify where the fish should be in this picture? Figure 1. Typical Grade A trout structure. It has cover from above, A strong bubble line funneling food near structure with a quick escape route next heavy fast current. Figure 2. Current structure defined between current seams and foam lines or bubble zone. Reading the Water, Part One, Introduction. No, this blog post is not about a magical river flowing from the headwaters of the Unicorn Mountains, and if you learn it’s secret language, you could read a story about a magical voyage long ago; rather, it is about knowing where fish can be located within a stream based on observable hydrological and structural characteristics. As a child learning to fly fish, I was always told that being able to “read the water” is an essential skill for an angler's success. At the very least, understanding the fluid dynamics and structural characteristics of a stream can lend the angler the ability to find fish within a given location. From the age of ten onward, I dedicated myself to learning about where fish like to dwell within the dynamic world of moving water. I recall sitting in the passenger seat on long drives into the mountains looking at the streams along the road. “Look at that spot; that ought to be a good spot to fish,” I would say, when I identified what looked like a fishy looking fluvial characteristic. Sometimes, I would beg my parents to stop and let me out so that I could at least make a couple of casts in another fishy looking spot just to see what would happen. I always brought my fly rod with me on family road trips into the mountains with an optimistic hope that a lunch spot would afford me at least a few minutes to practice my fly fishing skills. When I was 42, I left my previous two careers in favor of pursuing my fisheries biology degree. I spent a summer working as a stream surveyor for the United States Forest Service. Because I had so much previous experience being able to locate fish in a stream environment, I was tasked with conducting stream snorkeling surveys, looking for coho and bull trout. I later learned more scientific terms for defining different stream classifications and hydrological features both in school and on the job. I now have a language I can speak for describing fluvial fish habitat. I was scouting new water today while taking a bank side stroll with my wife. As we walked along I mapped out this rather featureless beat I might add to my guiding options. We pressed on hoping to find some water with more definition that would appeal to my fish finding senses. I saw an angler working some completely nondescript water, water that I wouldn’t even string up a rod to fish (see my post about laminar flows). To me, it would be like fishing on the moon. There would likely be fish present in that location, but there is nothing unique about the structure to give one a visual clue as to fish location. I then realized that the angler I observed might not be skilled at reading the water, or his skill set may not be strong enough to confidently fish the water with more defined structure and dynamic currents, like those located just upstream from him. I often see anglers fishing in water I rarely stop to explore. I used to wonder if these people knew something that I didn't, or if they just were not educated enough about reading the water? I know, after having snorkeled in plenty of water like the nondescript boulder flats I see anglers frequently fishing, that the fish are few and far between in those locations. Perhaps they are happy with the occasional fish that they work so very hard to catch? It would take me a hundred pages to describe the preferred trout habitat and the techniques to fish each and every one of them. To ease your pain, I will parse this information for you into smaller chunks you can read in small doses. Over the course of the summer we will define specific hydrological features and how fish utilize them. I will try to include as many videos and illustrations as possible, so that I can steer you out of the barren cobble flats with laminar flow into more exciting water full of fish. I will use a specific language to describe rivers and streams, not only when I am describing fluvial characteristics but also when I discuss benthic macroinvertebrate distributions within a watershed (yawn). Yes, that will be another day. Fluvial: Fluvial is a term used in geography and geology to refer to the processes associated with rivers and streams and the deposits and land forms created by them. Thalweg: is a line drawn to join the lowest points along the entire length of a stream bed or valley in its downward slope, defining its deepest channel -- often having the deepest, heaviest current. Laminar Flow: In fluid dynamics, laminar flow (or streamline flow) occurs when a fluid flows in parallel layers, with no disruption between the layers. Observed as smooth even current from bank to bank. Substrate: The composition of the bottom of the stream from sand, silt, clay to stones, cobble and boulders. Embeddedness: The degree to which fine sediments surround coarse substrates on the surface of a stream bed is referred to as embeddedness. Riffle: A riffle is a shallow section of a stream or river with rapid current and a surface broken by gravel, rubble or boulders. Riffles are instrumental in the formation of meanders, with deeper pools forming alternately. Pool: in hydrology, is a stretch of a river or stream in which the water depth is above average and the water velocity is quite below average. A pool must extend from bank to bank. A side pool does not extend from bank to bank but to the side with faster water defining one side if the pool. A side pool will generally have a current seam and back eddy characteristics. Current Seam: the parallel junction between two distinct current speeds as they slip past each other. Foam Line: Where bubbles gather in specific patterns along the length of current as defined by that current. Pocket Water or Pocket Pools: Small bank side pools outside of the Thalweg that are defined by and protected by boulders that cannot be technically defined as a pool. Wetted Width: the width of a body of water as described by the current water level. Up Next: Current seams and bubble lines. What do they mean?